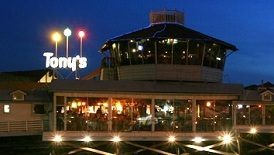 Tony’s Bar, referred to as Top o’ Tony’s, is located above the restaurant. It offers views from Santa Monica to Palos Verdes and is a popular spot to watch the sunset. Tony’s has live entertainment 7-days/ week. The bar is also well known for its signature drinks and Mai Tai- voted Best Mai Tai in the South Bay!